I often think that my story does not belong just to me, it also belongs to the generations of women who came before me. I grew up during the 70’s in Australia, a time where although it had become more commonplace for women to join the workforce, there were still very few women in senior roles. I was fortunate enough to have a mother who held a senior role within a multinational pharmaceutical company. I was even luckier to be surrounded by other women in my family, who were in the minority of women at the time in senior roles, I had a great aunt who held a senior role within a hospital and another great Aunt who was successfully running a family business. During that time, our discussions around the dinner table were around work, around contribution and around achievements. It was an unusual situation at the time to be surrounded by so many women who held senior, big, punchy roles, all of whom were ironically quite petite in physical stature. This encouraged me to question what I was going to do with my life, what my contribution was going to be. I attended an all-girls school where I was fortunate enough to see three pretty incredible women who were leaving the school with a real sense of strength and an understanding of who they were, whilst still having a gentle brace around them. I found myself working as an architect and town planner after attending Melbourne University. It was a space in which I found myself asking ‘how do you change the world; how do you influence the way in which people live and contribute in a positive way to their experience of their place or town?”. I loved working within this space and was working for someone who I considered to be a visionary, someone who could see a future which others weren’t able to see at the time. I learnt a lot from him and he rewarded my eagerness, throwing me into the deep end of managing big projects and clients which I was not ready for, whilst providing me with the support to work through it. He also encouraged me to study further and to go on to do an MBA through the Melbourne Business School. At the time, I had thought that the MBA would simply aid me further within my current role. I had not thought about what would happened beyond this role, I had been working in the construction industry for 10 years at that point and really loved my job. I felt blessed to be able to work in the space, however the MBA opened my eyes to the possibilities beyond the industry, I felt as though the world had become my oyster. The Melbourne Business School changed my life completely, it helped me change careers and to move from a career that I loved into another career which I now love and which has given me multiple opportunities. Without the skills, frameworks and thought processes that the MBS teach, there is no way that I could have made that transition. The question for me then became what to do next? I came across an article in a magazine all around the industries to watch in the next few years, industries such as super, telecommunications and IT. All of the industries that I look back now some twenty years later and recognise that they were indeed the industries to be watching. The article also profiled individuals to watch who were working within those industries, I wrote a letter, when people did still write letters, to all of those people who were featured in the article. The letter just expressed that I had seen their profile, my interest in what they were doing and a request for assistance in working out a future direction for my own career. I then rang every one of those people that I had written to a week later to arrange a time to meet with them, all of them agreed to see me. I went on to meet with them all, one though in particular had a significant impact on me, the meeting with Lisa Grey who was the CEO of Plum Financial services at the time. Like me, she had been a town planner early in her career. I found myself in her office, waiting for our meeting, holding onto my one page CV and suddenly feeling overwhelmed by embarrassment that I was here taking up this woman’s time to ask the question of what I should do with my life. In that moment I wanted the ground to open up and swallow me whole. Lisa came out, ushered me into her office and I handed her my CV. After telling me about her own story, she told me that it didn’t really matter so much what I did next but that I needed to move into a large blue-chip organisation in order to learn how they made decisions. As I went on through the meetings with the others I had written to, I found that I was consistently receiving similar advice. I decided to find the right large blue-chip organisation for me. It just happened to be that at the time BP was going through a major rebrand, including the launch of the ‘sunflower’ logo. They were promoting the message that the future of energy would look different from the past. I didn’t know what this meant, but I knew it sounded exciting to me. I came across an ad on the back page of The Age Newspaper for a marketing opportunity with BP and took this as a sign. I applied, got the job and joined BP. Since then I have done a whole range of things, I started in the network retail department which decides where sites should be built which drew heavily from my town planning and architecture background. I have also worked to procure electricity contracts, I have run the Bitumen business which is a marketing and sales business, I have been the regional director of BP solar, I have run their back of house Business Centre and I have been CEO of the Asia-Pacific area. One of the benefits of working for such a large company is that there are different components to that company, you can really go into different areas of the business or into smaller businesses that it runs. Areas where you don’t know anyone and no-one knows you, where for all intensive purposes you may as well be changing companies. I have been lucky to have those opportunities along the way, my first real step up opportunity was my role within BP Bitumen but just before then, four or five years into my time at BP I came into a career crisis. I had come from the construction industry where for the 10 years I had known exactly who I was, into BP where I had been in a number of roles in a short period of time and no longer felt that I knew who I was anymore. I did some serious soul searching, I was mourning the loss of that clearly defined previous profession whilst not being sure of my new identity, I needed to work out what it was that I wanted. I did a lot of looking through the job section of newspapers asking who would hire me. One of the great thing about job ads is that they tell you what you need to do in order to be ‘doing’ that job. After looking through a whole lot of job ads, I developed a list of the things that I wanted from a job, things like team leadership and P & L accountability. At the time, I did not know why P & L accountability was something that was so important to me, it was just something that I had seen in so many job ads. I had not run a business at that point so I was unsure of what it even looked like. Having done this a few times now, I realise that it is like your score card, it directly tells you whether what you are doing is making a difference. People often get caught up on the numbers side of the P & L, but the real value is in what the numbers are telling you, whether you should continue to do what you are doing or whether you need to make a change. One day I received a phone call from the HR manager of BP informing me that there was a job opening at BP Bitumen, recommending that I think about it. My initial reaction was that I did not want to work in bitumen, that I knew nothing about asphalt and that I did not want to work in such a ‘blokey’ area of the business. The HR responded that it was a real pity that this was my view because the list of things I was looking for in a job would all be satisfied in that role. Reflecting on this I decided not only was I now interested in the role but that I really wanted it. I went to BP Bitumen, which was a national marketing, sales, and manufacturing business. I worked with a brilliant group of people who were using technology to provide high-end bitumen products. The business had a research and development function, a marketing function and all the components that come along with this. I realised that moving into the manufacturing business out in the middle of a paddock gave me a lot of freedom to meet new people and to ask lots of questions in an area of which I knew little about. This also helped me to identify what my skill was, I realised that my skill was facilitation, helping lots of people with different capabilities to pull those capabilities together in order to move a business forward. I am now the Vice President of Sales and Marketing for BP Australia, I have now been with BP for the last 17 years. BP probably would not have existed had it not been for some small coloured rocks in the outback of Australia. William Knox D’Arcy, the founder of BP, is likely the most famous Australian that you have never heard of. He was a lawyer who came out from London to live in Australia in a town called Lightening Ridge in Queensland. He was advising and in partnership with two local minors at Mt Magnet, who struck an enormous deposit of gold. He returned to London and became a ‘party boy’ by all accounts, spending and then investing. He began investing in oil exploration in Persia, it did not go well for a long period of time. His funds were beginning to dry up to the point that he sent a telegram to the head of exploration asking him to give up as the failed explorations were wasting away the last of his funds. The exploration head decided to ignore the telegram and to give the exploration a few more goes, on the last attempt they struck oil. What came to be known as BP was found, returning to Australia in the early 1900’s. I always like to think that BP, which people know as British Petroleum, really would not exist without the connection to Australia. If you were a child in the 70’s, you will remember the milk bar or corner store journeys, stores which were usually run as family businesses. In the mid 70’s we began to see changes to trading hours, opening up the opportunities to the trade on the weekend and late night. We saw the rise of the convenience store, for BP in the early days this took the form of the Food Plus brand. This change in the way that people live is continuing today, we see a multitude of urban apartments, an aging population, we see people working longer hours and starting families later. We are making choices about how we spend our money, people are eating out in cafes and restaurants and are looking for convenience given the longer hours of work. Often people are looking for something that they can eat on the way home or pick-up and then heat once they arrive at home. All the demographic factors are changing Australian cities significantly. BP has many different partnerships with retailers all around the world looking at transforming convenience retail, Australia is ripe for that change. The quality of offer in this space has a long way to go, there is a lot of opportunity to bring a new convenient offer to consumers that matches the way in which people actually live now. This new app allows consumers to pay for the petrol they have pumped into their car via their smart phone, as opposed to coming into the store and paying for the petrol over the counter. We introduced the app for that scenario where you have kids in the car and don’t want to leave them in the car alone whilst you go in the pay. The development of the i-Phone and of apps creates a gateway in terms of digital capabilities, something that companies such as BP need to make the most of. It is about listening to what it is that our customers need and then providing the right customer journey for each customer, whether they are someone who wants to come into the store and grab a snack when they fill up or whether they are someone who spends long periods of time on the road or who has children in the car and just wants to get in and out of the petrol station. The BPMe app is a great example of addressing a real problem or issue in customer’s experience. I was lucky that in the first part of my career, in building something or influencing an outcome within a public space, one of your core skills needs to be facilitation. You need to be able to work with the key stakeholders who may help you build that space or who will be using that space. You learn very quickly to ask questions and to listen not just to what people are saying but what they really mean. The first ten years of my career within that space really moulded my capabilities around facilitation. I was then able to bring this into a large corporation who is very good at developing and maintaining partnerships. It is one of those spaces in which you need to use speaking and listening in an equal ratio, you need to listen to what it is that your partners want and how they like to work, you then need to be articulating this back in the other direction and finding that common ground. Time is often the deciding factor in whether a partnership is successful, whether you have spent enough time listening and talking or whether you have just gone straight to the doing stage. I am passionate about data, something which I never thought that I would say. Coming from a design field I never thought I would be passionate about data but I am, it is likely having a conversation with your entire customer base at the same time. It is data which tells you what they like and what they don’t like about what you are doing. The whole industry that we know as finance is changing because of digitalisation, we see processes being off-shored and automated. For a finance professional, being able to get an insight into what the data is actually telling you is key, and what you can in turn do to intervene. Instead of thinking of it as big data I prefer the term insights because it is a tool which is telling you what to do. We have done a lot of work around this, working with the Melbourne Business School Centre for Data Analytics who lead the way in this area. They see data, move it around and visualise so that it can become helpful and lead to intervention, in a way which is much more accessible than the old days of having reams and reams of excel spreadsheets. It is pretty exciting that we live in a time where we can isolate data to not just look at sales but to look at a particular store and what is happening within that store which is impacting upon its sales. The world has changed so much that you need to lean into these spaces, not just to keep up but in order to succeed. I would say that if you are wanting to have a conversation with someone and to ask for advice, go and do it today. I still remember the day that I was sitting in the office of Lisa Grey feeling embarrassed, but you find once you ask that people are generous in giving and are insightful. I would also say that you need to back yourself, you do not really know what you can do and what you can turn your mind to until you are there. Don’t be afraid to talk to people openly or to ask the dumb questions. We need to be comfortable with not being the expert in the room. You need to take the attitude of giving it a go, after all, what is the worst that can happen? If I have a spare 5 minutes I will be checking news websites or some of my favourite sources like the Mary Meeker report in the area of technology. I don’t necessarily set aside an hour block of time each day or anything like that, instead it is how I utilise my incidental time. If I am reading a book I tend not to read it from start to end if it is a content book, I will tend just to dive in and out. If you treat reading a content book, such as a book on technological change, as though you have to read it from start to end then you will find that you often don’t end up finishing the book. Just grab the stuff that is useful for you and move on. This quote was used by one of my very first bosses regularly and constantly remains in the back of my mind, it is Emerson’s quote ‘What lies behind us and what lies before us are small matters compared to what lies within you’. I think this is the heart of it all, thinking about who you are, what you stand for and then backing yourself. 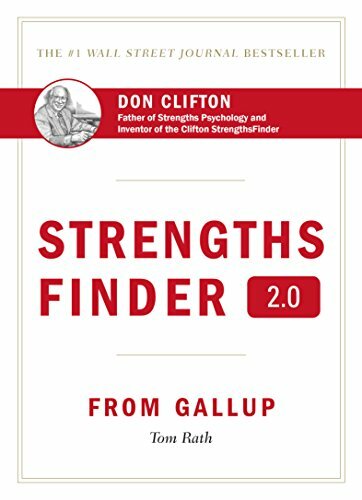 I would recommend Strength Finder 2.0 by Tom Rath which I love. It is a book which helps you to do an online assessment in order to identify what your areas of strengths are, it only looks at your strengths and it presents you with the top 5 things that you are really great at. I find that often your strengths lie in those things that bring you joy, this is what gives you the sustenance to go on with your career. I do the Strength Finder test every year and have found that my strengths change every year. It is a bit of a shot in the arm, recognising that you are good in certain areas but then also reflecting on whether you are using those strengths and whether the job that you are in is allowing you to utilise them. It also highlights for me the strengths that I would like to build on or that I may need to build on in order to move into a particular area of work. I would recommend reaching out through LinkedIn, I can be found under Brooke Miller.